There are literally hundreds of 2mm hex shapes on a dozen or so parts and mainly are on non-flat surfaces. These are molded with a raised outline for the hex patterns. Based on the box art and common sense (or my preference, take your pick), these hexes should have a fine engraved outline. Sanding and scribing is not an option...I'd like to actually finish the kit and keep my sanity. So...I am vaguely remembering from the 70's a technique for sanding raised panel lines down and then painting liquid cement (plastiweld? Testors?) on the surface. The raised part sanded down would "melt" different than the non raised part and thus create a slightly lowered line. Does anyone else remember this and does it work or am I hallucinating a wishful dream? It does look like there's an unseen area to test this out. OK, I've done a few back of napkin computations using Clare's measurements and I have good/bad news. Fortunately, the front support is fairly close, maybe 1/2" scale too thin. The stabilizer isn't as bad as I thought, maybe 3/4" scale too thick although I think the cross-section shape is dubious. So why does it look wrong to me? There's not enough room to build in a proper rudder actuator rod. So, apparently the tail end of the Pegasus kit tapers too quickly which made the stab/rudder look too thick. I've guestimated the open tail end area of the fuselage to have a diameter of around 8.7". The kit scales to about 2" here. 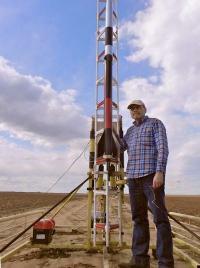 There's a number of flying rocketry kits that will get you most of the way there if not all the way. If you're not going to fly them then construction would be simpler, but you'll still need to scratch build the little fiddly bits and engine bell(s) depending on the kit. Some Tripoli guys built and launched a 1/10th scale Saturn V. I have a Black Brant X that's a little over 8' tall that came from a Public Missiles kit. Awhile back SpaceX released a flying rocket kit of their Falcon 9 and Dragon. Don't know the scale, but stands about 22"--you could ditch the body decal and roll your own details and paint scheme. The "reinforcement strap" on the fuselage is a wiring tunnel and fairly common on rockets. The Pegasus kit has a strange triangular shaped strip instead of rectangular-ish. I believe the opening at the rear was for a radio tracking antenna that a number of V-1's had fitted so the Germans could get some idea of where they were landing. The kit also has this opening wrong--completely omitted. Thank you for your time, very much appreciated. I'm trying to get this Pegasus 1/18 V-1 Flying Bomb wrestled to the ground and suspect there is at least one dimensional problem in the tail area. The vertical stab and rudder appear way too thick--thicker than the front pulse jet support which may be too thin. I have not been able to find any pertinent dimensions for the V-1 (or even the Loon)--surely someone, somewhere has actually measured one of these things for other than total length and wingspan. I'm tinkering with photographs and video scrounged off the internet to try and scale something off a known dimension. I have several books on the V-1. I've ordered a 1/35 Bronco V-1 just for comparison. Hopefully they didn't phone it in. I have strong google-fu skills, but I might have missed something. Any other ideas? Sources? Other than the Accurate Armor kit, does anyone know of any M114 APC kits in 1/35th scale? I wanted to convert one into a FMC proposal for an early 60's Kanonenjagdpanzer so hate to muck up an expensive AA kit. Looks like the lower-hull/wheels/tracks is the main thing I need from the M114. If not, I guess I'll get out my magnifying glass and try the Herpa HO scale thing. What is this "finished a[nother] model" concept that you speak of?